PHUKET: Phuket’s Old Town streets will come alive on Sunday morning as Por Tor Festival celebrations begin on Thalang Road. The Por Tor Festival begins on Sunday in Phuket. The Por Tor Festival (also called the Hungry Ghost Festival) runs from September 2 to 15. A “red turtle” parade will be held on Sunday morning from 10am, starting at the Her Majesty the Queen Sirikit 72nd birthday park (the Dragon Park) on Thalang Road. The parade will pass along Thalang Road, Yaowarat Road, Phang Nga Rd, Charter Bank corner, Rassada Rd and arrive at the Phuket Downtown market on Ranong Road at around 12.20pm. The following Sunday (September 9) there will be another parade starting at the Saphan Hin Plaza (near the Mining Monument) at 9am, passing through Phuket Rd, Kra Rd, Takuatung Rd and finishing at the Bang Neow shrine (also called the Por Tor Kong Shrine) on Phuket Rd. The global Chinese festival is an important merit-making event, where people offer special food, such as the red turtle cake pictured, flowers and candles to ancestors. The offerings are also extended to the “hungry ghosts” who are without relatives. 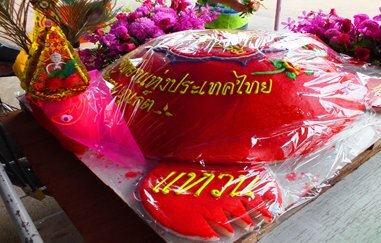 The most common offering is a red turtle cake, known locally as Aung-Gu. The red colour symbolises good luck for the Chinese, and the turtle symbolises long life, good health, good luck and prosperity. The sweet cakes are made from wheat and sugar and are sometimes fried with egg. Chanchai Duangjit, TAT Phuket Office Director said Phuket Provincial Governor’s Office has chosen the Por Tor festival to be one of the main festivals to help promote Phuket tourism, and for tourists to find out more about Phuket culture and traditions.